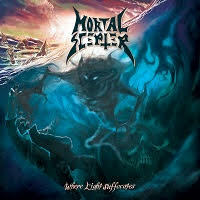 Hailing from France, MORTAL SCEPTER released their first album on Jan. 22, 2019. While I’m not usually impressed by Thrash Metal revival acts – or any revival acts in general – I have to say that MORTAL SCEPTER’s take on Teutonic (German) Thrash Metal is really good. Coming in on a technical approach, MORTAL SCEPTER make some really twisted Thrash Metal riffs that sort of just intertwine with one another. A great example is the first track, “Where Light Suffocates…”, where the leads and rhythm guitars sort of blend together into a whiplash-inducing whirlwind of Thrash Metal. I mean, it makes sense; they are French after all. Tech is in their blood. Like I said before, this album is very Teutonic Thrash Metal oriented, having a lot of EXUMER influence in tracks like “Perish with the Flesh” and DESTRUCTION influence when things get more technical with “Murder the Dawn”. Things get heavy with “The Carpathian Castle,” as the concluding breakdown unexpectedly crushes your ears with groovy pleasure. The album ends with “…The Scepter Reigns,” a 10-minute epic that is a sequel to “Where Light Suffocates…”. I was excited to see how a Thrash Metal band of this style could maintain a 10-minute song without a long intro or outro, and I was happy to see that the whole 10 minutes were full of riffs as well as an atmospheric interlude. The only weakness I see with this album is the structure. While I understand the importance of starting the album off strong, especially for a Thrash Metal album, I would have liked to have heard more song like the first track. Basically, the first song was great, and it heightened my expectations, causing me to want more from the rest of the material. While the rest of the material was good, it wasn’t up to par with what the album was introduced with. Other than that, the album is pretty great. The material is solid and heavy with good execution and songwriting. The production isn’t good, but it’s supposed to mimic old school German thrash, and it goes beyond that. MORTAL SCEPTER have released a beast of an album.